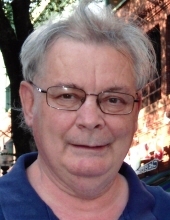 VITT, DANIEL G. of Norwood formerly of Cambridge and Brighton passed away on March 25, 2019 at the age of 71. Beloved husband of Stephanie L. (Goodwin) Vitt. Devoted father of Andrew J. Vitt and his wife Jennifer of Malden and Garrett E. Vitt of Norwood. Brother of Adelaide Walsh of Allston and Ellen Lewis of Scituate. Also survived by many nieces and nephews. Son of the late John W. Jr. and Helen (Hurley) Vitt. Daniel was a retired Chief Accountant for the Commonwealth of Mass, Dept. of Environmental Protection. He was a longtime Norwood Little League and Babe Ruth Baseball Coach winning 2 championships. He was also a member of the Brookline Elks and Former VP of the Executive Board of NAGE Unit #6 Local #282. Funeral from the Kraw-Kornack Funeral Home 1248 Washington St. Norwood, Saturday March 30, 2019 at 10am followed by a funeral mass at 11am at St. Catherine of Siena Church Norwood. Visiting hours will be held on Friday, March 29, 2019 from 4-8pm. Burial will be at Highland Cemetery Norwood. In lieu of flowers donations may be made in his name to the American Heart Assoc. 20 Speen Street, Framingham, Massachusetts, 01701. To plant a tree in memory of Daniel G. Vitt, please visit our Tribute Store. "Email Address" would like to share the life celebration of Daniel G. Vitt. Click on the "link" to go to share a favorite memory or leave a condolence message for the family.